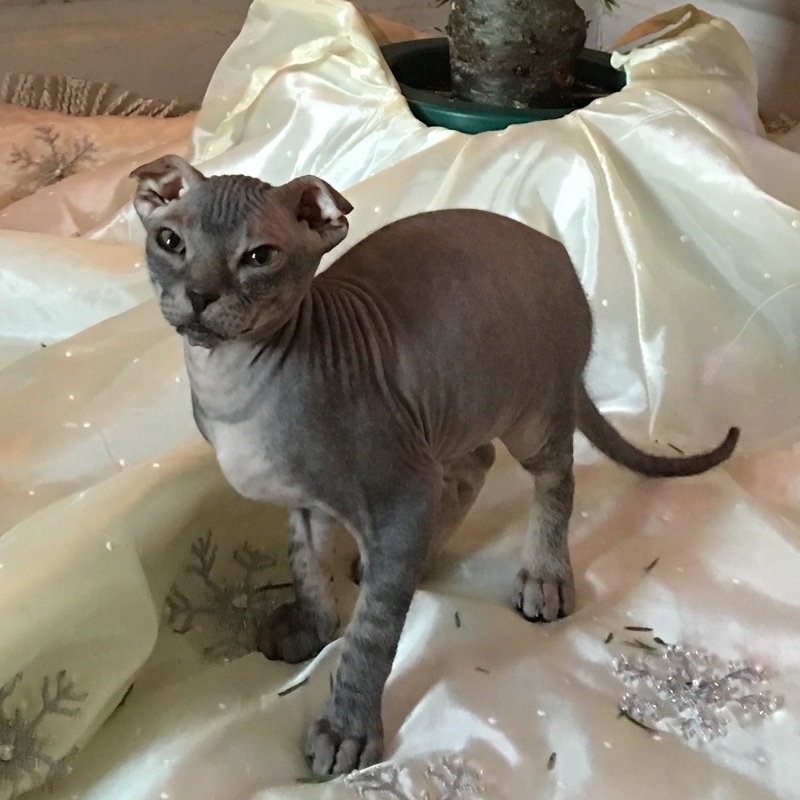 The Ukrainian Levkoy breed is fairly new and relatively unknown in the U.S. (NO RELATION TO CANADIAN SPHYNX) Elena Vsevolodovna Birjukova is a Russian breeder who developed this unique cat. 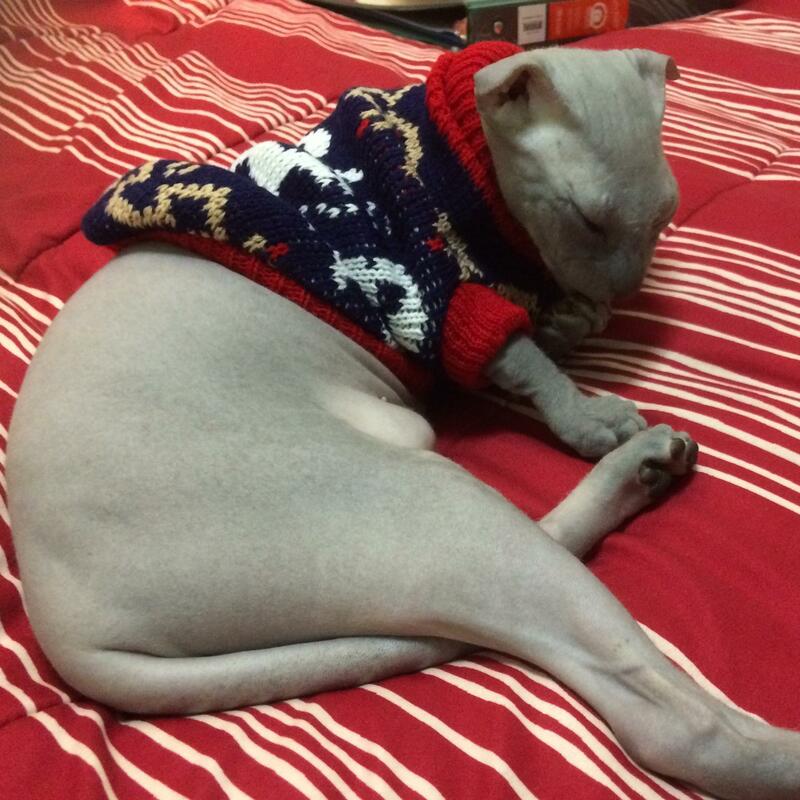 In order to achieve this, she crossed a female Don Sphynx cat with a male Scottish Fold. After many tries and years, she finally accomplished her goal in 2004. In Europe this cat is also known as the Levkoj or Levkoi (as our Queen Wendy/ Misha is registered). The cat is already recognized by cat associations in Europe (such as ICFA) and it's a matter of time before it gains popularity in the West and with TICA. Levkoys are beautiful and elegant cats. 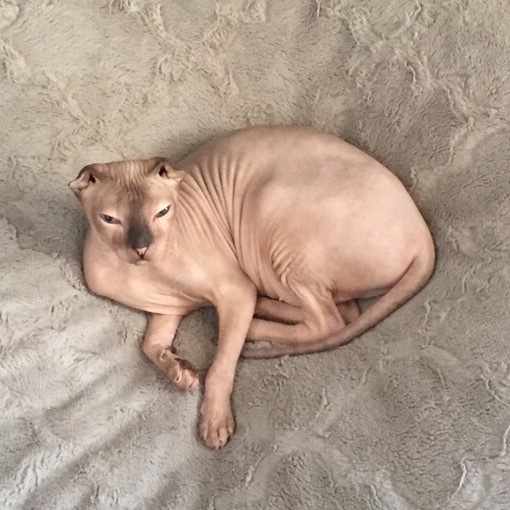 What makes them unique are their folded ears, though some are born with straight ears (smaller in size than any other straight eared Sphynx or Peterbald). Their prominent cheekbones give their face a rounded appearance. Levkoy eyes are almond shaped, set at a slant. They also have long legs and tails. Their skin pigment has a wide variety. Although sometimes undetectable, they are covered in peach fuzz. Some more than others, majority do have at least one patch of fuzz whether it is near their mouth (whiskers), on the nose area, on the paws, or on the tail. Many people prefer the coating since it is soft and more pleasent to the touch. These cats do not do well in extreme heat or cold. They prefer to stay warm at all times. Levkoys are quite playful, but many grow out of the playing phase as they age. Although playful, these cats don't mind their alone time either. They are great for any family with children or other pets. Monitoring children is crucial, as most cats do not enjoy rough play. These cats are very active, loving, and affectionate. Their average weight varies from 6 - 9 pounds. The life span is anywhere from 12 - 20 years. Since these guys are prone to gum disease and tooth decay, weekly brushing is a MUST. 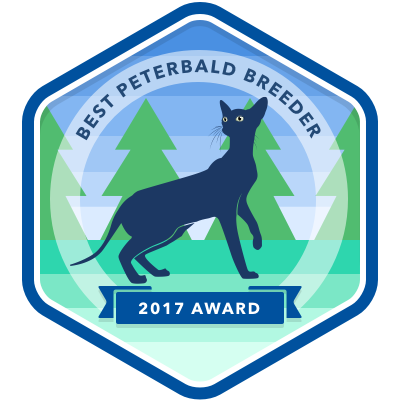 The Peterbald breed was established in 1993 by a Russian cat breeder, Olga Mironova from St Petersburg (where its name derived from). She crossed an oriental female with a donskoy male, and from this union was born a new Peterbald cat breed. These cats also have an elegant look to them, their bodies, legs and tails are elongated although sturdy looking, and usually are slender. What differentiates them from their sister breed, Levkoy, are their ears, head and certainly their personality. The ears of Peterbalds are quite large in size and pointed. Their heads are shaped like inverted triangles, giving the faces an elongated look, with a flat forehead and high cheekbones. They also come in a variety of colors and patterns. They also come in different coatings, varying from bald, flock, velour, and coated (hairy—sometimes by 2 years of age the fur sheds off greatly). The breed is accepted in TICA. As for personality, these cats are the ideal companions. They are extremely friendly and get along with everyone, cats, dogs, children, anyone. As with some young children, the playing can get quite rough, the Peterbald will just walk away instead of getting violent and resorting to their claws. Peterbalds are very playful, and resemble a lap dog in their personality. They never leave your side; they will sleep with you in your bed because they love to be cuddled, and most definitely will let you know vocally when you are not giving them attention. The only “downside” is that they can get quite vocal and demand attention when it isn’t given. They are absolutely not a cat that should be held in solitude. Every Peterbald is kind, gentle, affectionate, loyal, and admires their owner, also being friendly and playful with anyone they meet. You should definitely try playing fetch with your Peterbald and a rattle mouse, you will be amused. They are highly intelligent, and are one of the easiest cats to train to do tricks, and to comply with rules at home (such as not turning your favorite couch into a scratching post—as long as you catch them on time). This cat is very attentive to its owner, and will become your best friend. The average weight of Peterbalds is anywhere from 7 – 12 pounds. And life expectancy is 12 – 20 years. As with many cats, dental hygiene is important, and neglecting it can cause gum disease and tooth decay.